The light is going and there is an icy wind blowing as we walk up the canal to the bleak grassy corner. Brother Johannes told us yesterday this is where the young Oromo hang out and they are here now. [Ed.–The Oromo are the largest ethnic group in Ethiopia and the Horn of Africa.] Some 20 to 30 young men queue around a white van distributing food from the back. Some others are charging their phones. I get talking to one boy who speaks reasonable English. Dhaba tells me he is 15 years old and from the Bale area, a mountainous region in the middle of Ethiopia. He’s delighted when I tell him I have been there and think it is beautiful. He has been sleeping rough on the streets of Calais for the last eight months. He did make it into the back of a lorry once when he first arrived. It dropped him in Germany. … I don’t want to, I have an uncle in the UK. So why not go the legal route and ask for family reunification? … Because it takes too long. But you have already been here eight months. He shrugs. Where are you sleeping? He points to under the bridge. The police come every night and take our sleeping bags. We talk some more. He is not sure where this uncle is and does not have the phone number. He cannot get it from home because he has no credit left to call there. He has nothing. But he knows he wants to be in England. The rest of the group have gathered around Asmamaw (my husband, originally from Ethiopia) and I. They want to know what we have brought for them. Asmamaw is translating from both Oromipha [the language of the Oromo] and Amharic [the official language of Ethiopia]. Dhaba and I talk more. He wants to phone Ethiopia to get his uncle’s details. I know there is a Facebook page helping with credit for young people like him. I promise to meet him tomorrow when we have found out more. The French government thought that destroying ‘the Jungle’—the self-made community of refugees on the outskirts of Calais—would solve the ‘migrant’ problem in the town, but all they have done is scatter the migrants farther out and make some of them go into hiding. The community has dispersed, but the people have not disappeared. The pepper spray and nightly removal of sleeping bags has not stopped the procession of dreamers coming north. At any one time there is an estimated population of around 1000 in the town but it is constantly changing so the actual numbers of those passing through are much higher. This bleak corner is just one of a number of distribution points. I spent part of yesterday afternoon standing at the main one on a piece of wasteland under an electricity pylon, in the industrial zone just along from the site of the old Jungle. At least 200 young refugees had gathered for afternoon distribution. There was a van serving hot food out the back door. The Refugee Youth Service had set up another van with an awning and put out tables and chairs where young boys were playing chess. Further over, a group of Afghans were playing cricket. The School Bus was there offering English classes and social activities. Given that all the refugees here had spent the night sleeping in the surrounding hedges, the atmosphere was remarkably cheerful. There were also toilets and sinks, both stand-alone chemical ones and some in trucks. … When I arrived here in 2005 there was one water tap that the homeless and refugees could use in the whole of Calais. Brother Johannes told me. There are now 14 open every day, and you get 6 minutes or 10 if you are a woman. Brother Johannes has adapted to changing times as well. He has always seen the necessity to be ‘prayerfully present among refugees and migrants,’ which is why he persuaded his order to let him establish a house in Calais some years ago. This house is a community for anyone medically or psychiatrically unwell or very young. At any one time there may be 15 living in the house. Some have been suicidal, others had alcohol problems. No one is forced to move on but the population in the house has changed over time. …Most of the Afghans have gone to Dunkirk; now it is mainly Ethiopians and Eritreans. Given the miseries of life on the street and the difficulties and dangers of reaching the UK, why do so many persist in trying? The reasons are varied. This morning an Iranian man in Dunkirk told me he had already been deported twice from the UK, but he was determined to go back because he was happier and safer living illegally in Britain than France. Johannes tells us: Refugee attitudes have hardened since the increase in police violence towards them. They cannot imagine living here. They want to work and study which is almost impossible in France or Italy. Some Afghans and Sudanese have decided to stay but the Eritreans and Ethiopians rarely change their minds. … But there is nothing there, they cannot help you. I am afraid of being returned to jail there. Asmamaw and I go back to meet Dhaba the next afternoon. Stevie from the Refugee Youth Service has discovered that he is on the list to get phone credit from the Facebook site, but that is monthly so I give him something to get credit now and he will try and connect with a legal team next week. Meanwhile he wants to tell me his story to put on the Migrant Child Storytelling website [which Lynne has created with Luke Pye to allow migrant youth to tell their stories themselves]. We sit at a café table in the afternoon sun while he tells us of fleeing Ethiopia because he was afraid of being imprisoned and tortured after demonstrating with other students and school children, of being beaten and imprisoned in Libya, and of finally getting to the Jungle just before it was shut down and all its occupants evicted. Again and again I am struck by the courage, intelligence and resilience of the children who make it this far. Why are we wasting the lives of these extraordinary young people? … You know they closed the asylum office in Calais when they destroyed the Jungle. Now you have to get to Lille and once there it can take two to four months just to get an invitation to give fingerprints, during which time you have no support and can still be deported, the volunteer from Secours Catholique explains. It’s impossible. No wonder that Dhaba and others would rather put their energy into the daily gamble of the parking lots. Read more of this diary, Calais 2017. Diaries from Calais in November 2015 and October 2016 (covering the Jungle eviction) are also available. 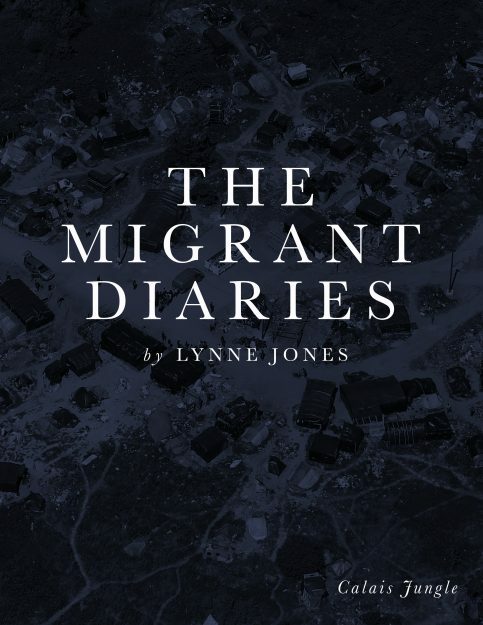 Editor’s Note: This is the fourth of a series of diaries about working with refugees and migrants that Lynne Jones has shared with FXB. We are honored to publish them. All opinions are those of Lynne Jones. Items in [ ] are editorial additions. Lynne Jones, FXB Visiting Scientist, is a child and adolescent psychiatrist, writer, researcher, and relief worker. Her most recent book is Outside the Asylum: A Memoir of War, Disaster and Humanitarian Psychiatry. *All migrant names are pseudonyms, personal details have been altered, and all have given permission for their stories to be told. All have known their photos were being taken.